Fix me up with my perfect job! Wouldn’t it be great if you could simply wave a magic career wand and conjure up your perfect job? How much time would this save? Sadly it’s not that simple! If you want to get the right job for you then you are going to have to put the effort in. Despite the openness with which people share their lives on social media, we really don’t know ourselves very well. 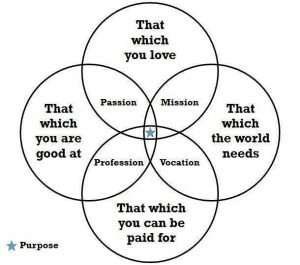 If you want to find fulfilling work which gives you a sense of purpose you’ll need to invest time, thinking honestly about what’s important to you. Considering these key elements in combination can help you identify a job that’s right for you. Whilst there may be no such thing as the perfect job, investing time trying to achieve personal career fulfilment will be time well spent, particularly in the light of all that you’ve already invested in your education! The mistake many people make is to focus on only one or two of these four factors. For example it might seem sensible to focus on what you’re good at and what pays well. You’ll be able to complete applications and match your skills to a job role. However unless you’d also love to do the role you may not convince a recruiter that you’re an ideal match. Even if you’re successful, there’s a risk that whilst you may be productive in a job and earn good money, you’d feel drained because the love just isn’t there. We often fail to recognise that doing what makes us happy gives us energy, the reverse is also true. Looking at what you love to do in isolation possibly won’t work either, you might find you can’t pay the bills. If particular opportunities are in short supply (for example in publishing or City law) the recruitment process might feel like a bit of a lottery. If at first you are unsuccessful it will be important not to take it personally. Don’t think of a job as a single destination. Many people will need to make a few considered moves and try jobs out before arriving into roles that feel like ‘home.’ Sometimes thinking laterally and taking a job similar to the one you want can be a smart first move. a). Think of a game you liked to play when you were young? What role did you assume in this game? What qualities did you perceive yourself as having? Did you play alone or with others? (b). Think about characters in books, on television or in movies which you admired when you were growing up. What did you liked about those people? What were their characteristics? (c). What are your family ‘rules’, spoken and unspoken? For example, ‘ no one in this family does a low-status job.’ You may actively choose to comply with, or rebel against, your ‘rules’. Either way you will have been influenced by them. (d). Can you find evidence of early influence on your decisions up to now? Is anything likely to influence your future choices? This is about your personal strengths. Go to Jobmi to create an account and complete a free online questionnaire. Talk to people with interesting jobs. Attend careers fairs and network at events that look interesting. Curiosity will be your best guide to what motivates you. Follow up on what fascinates you. Have a look at this website to help you think about your skills, motivations, values and passions. What do these tell you about the kind of work environment that might suit you? Complete this free personality questionnaire. Any work experience will help you discover aspects of what you want/don’t want in a job. If all jobs paid the same, which would you choose? This question may help you identify roles that genuinely appeal. For more in-depth personal career exploration, ‘How to find a job you’ll love’ by John Lees and ‘What Color is your Parachute?’ Nelson R. Bolles are helpful. You should now have a more complete picture of your unique skills, values, strengths and motivations. Why not discuss your information and your implementation plans with your Careers Consultant (or even a close friend or family member)? So, there are no quick fixes to finding your perfect job. However, taking the time to focus on what’s important to you, knowing what you want and why you want it will make you more compelling to recruiters. Your values, motivations and interests and most importantly your authenticity, will help you to stand out and increase your chances of both success and personal fulfillment. Tags: Applications, Career planning, Job search, Skills. Bookmark the permalink. Previous post ← Graduate Job applications – what you need to know!